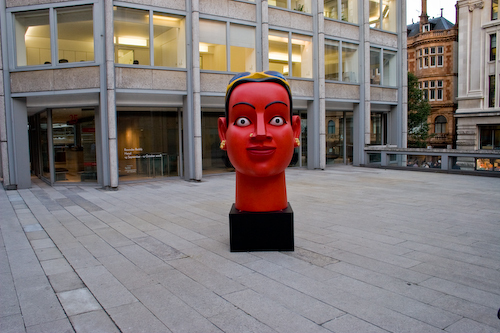 The Contemporary Art Society and The Economist Group, in association with Grosvenor Vadehra, are pleased to present a new work by internationally acclaimed Indian sculptor Ravinder Reddy at the Economist Plaza. 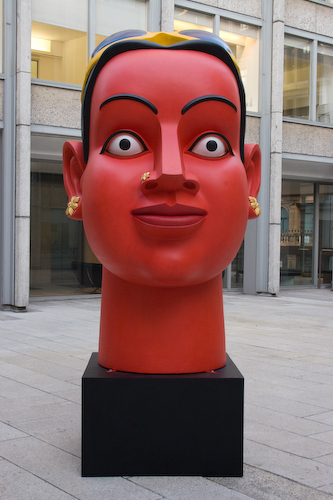 Sculpted in fibreglass on a grand scale, Reddy’s monumental female heads are among the most visible and recognisable examples of contemporary South Asian Art. 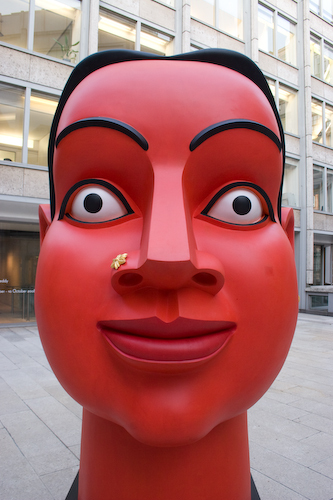 One of the first contemporary Indian artists to draw critical attention in America following his show at Deitch Projects in 2001, Reddy fuses pop and folk sensibilities with the traditions of Hindu sculpture. 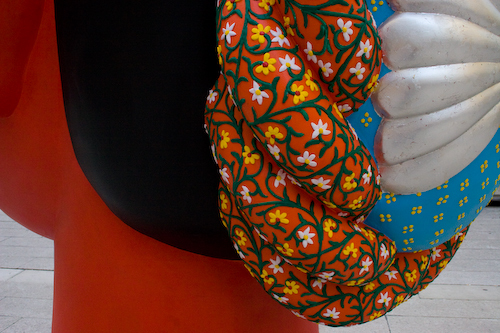 His works suggest a multifaceted femininity that is at once rooted in the past whilst embracing the contemporary world. 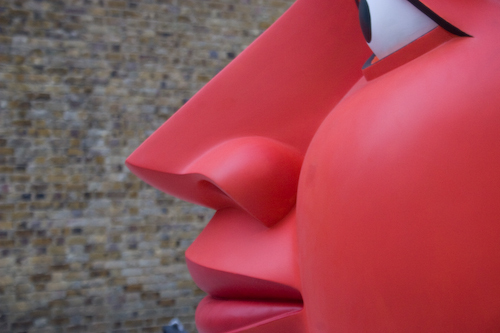 Decorated with brightly coloured thick red car paint and gold gilt, Reddy’s heads appear to be kitsch personified. 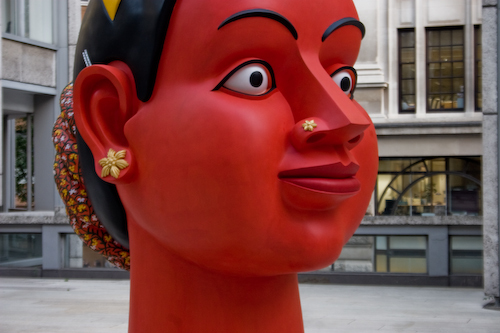 However, their grand, confrontational stance and unblinking stare prevents them from becoming a comic spectacle – Reddy’s works would be neither out of place in a modern bazaar nor in an Indian temple. 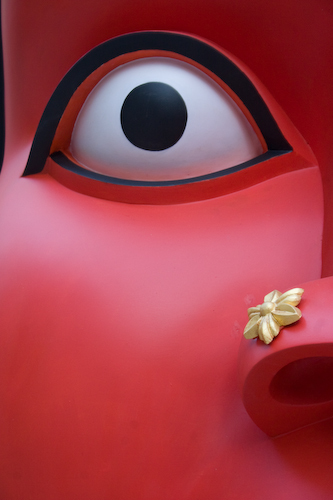 Some are given ordinary Indian names while others are bestowed with the names of great deities. “My Life force is women – they are the source of growth and life in my work.” Drawing inspiration from the real people he witnesses in New Delhi, these wide eyed and self-assured women are the everyday goddesses of an urban age. 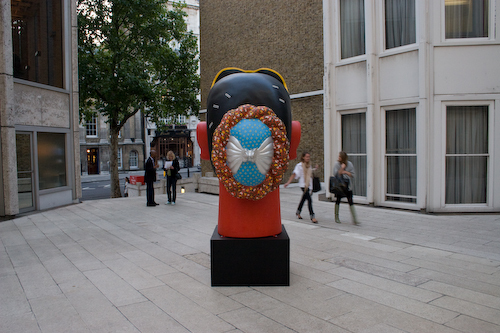 G. Ravinder Reddy was born in Andhra Pradesh (1956) and educated at M.S University, Goldsmith’s College, University of London and the Royal College of Art. 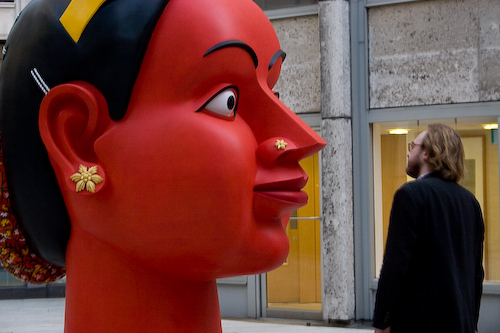 Exhibitions: Grosvenor Vadehra, London 2007; Walsh Gallery, Chicago, 2003; Deitch Projects, New York, 2001; Art Today Gallery, New Delhi, 1997; Chennai / Sakshi Gallery, Bangalore, 1991.